This blog post was written by Moriah Akrong, founder of The Golden Lotus Project which was created to empower and support women and girls throughout the nation. Please look out for the 24 days of giving starting March 1st. To learn more about The Golden Lotus Project and what you can do to contribute, please go to www.goldenlotusproject.com. Brown girls Love, Power Day 2018 was everything I wanted and more. As I prepared for the day, I reflected on my previous experience during Power Day 2017. Attending made it clearer to me than ever, that representation DOES matter. I was sitting in a room full of ambitious women like myself, and women who run amazing businesses that look like ME! I left there literally feeling like I was more than capable of crushing each and every one of my goals. For me 2017 was a more disciplined and productive year and I can honestly say it had a lot to do with me attending Power Day 2017. I had a recharged commitment to my goals and was ready to see everything come to fruition. Fast Forward to this year's Power Day and believe it or not I left there with more energy than I had from the previous year. And I think there were a few reasons why. First things first (I’m the realest! Yes it was corny but tell me you didn’t sing that in your head! Ok don’t be cute just admit to it! ), Founder Christina Brown simply put together an amazing event. It was clear how much thought she puts into planning and the passion she has behind this mission. Secondly, I know I walked into the room differently. Now I already consider myself a pretty confident and talkative person but I don’t always speak up when I should (typically when it matters ya know?). This time I walked into the room and knew when ever I saw the opportunity, I would talk to people and introduce them to my brand. Instead of handing out business cards, I handed out pins from one of my collections, which proved to be WAY more effective and served as a better promotional aspect. It was a great talking point and helped me give my quick spiel without rambling. If you’re someone like me that sometimes struggles with that awkward intro part consider something tangible like the pins, buttons, stickers, anything non traditional to hand out during events. Lastly, I appreciated the honesty and the realness that each and every speaker provided during their segments. Each of them left me with something to hold on to without sounding generic. THERE WAS ABSOLUTELY NO SUGAR COATING! And I loved it. The conversations were intimate and even though this year I wrote significantly less down in my notebook, I was totally okay with that! I think the difference was that I was really taking in what they were saying and personally reflecting in the moment, that writing was the last thing on my mind. Even the Mompreneur panel (@miaray, @kimroxie, @whitpr, @melrwhite ) gave me all types of positive motivational feels and I’m childless! Sometimes when people say “Stay true to yourself”, it sounds cliche but that's one thing I carried with me out of this year’s Power Day. Sticking to your morals, what you value, what your passions are, that’s what makes you unique and will take you where you want to go. It may not happen instantly but you will reap the benefit of never losing sight of that. So after completely getting my entireeee life I walked away refreshed, proud, motivated, and recharged. Plus our swag bags were litttttttttttt. So I think after reading this it's clear that I highly recommend attending Power Day. Whether you think you have it all the way together or just trying to figure out what that even means, this is where you need to be next year. For me personally this is when I feel like my New Year begins. This is when I confirm my New Years plans, personally and financially. It makes me accountable and truly sets the tone for how I want my year to go. I feel like someone’s Auntie somewhere once said “Any opportunity to do better is a good opportunity, so ya better get ya a** there.” Right? 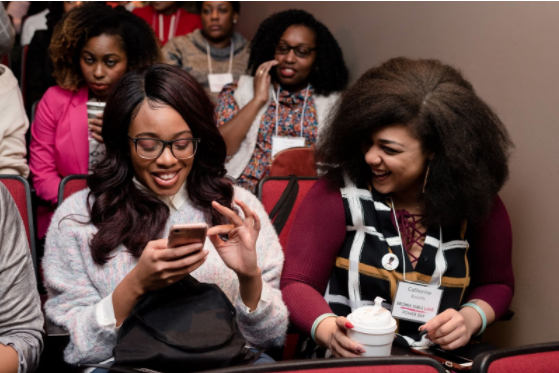 But seriously I really hope that if you’ve never been you make 2019 the year you finally attend Brown Girls Love Power Day 2019.